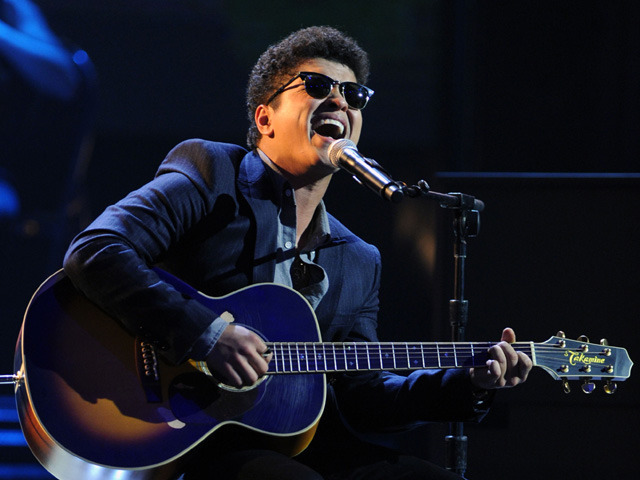 NEW YORK (CBS) Along with receiving seven Grammy nominations, newcomer Bruno Mars was one of the many high-profile stars to perform during the Grammy Nominations Concert on Wednesday night. The rising R&B singer, who landed second behind rapper Eminem in the total number of nominations, first hit the stage to perform an acoustic rendition of his hit "Just the Way You Are." He later returned to perform alongside B.o.B. for their collaboration "Nothin' On You," which garnered a Record of the Year nomination. Katy Perry opened the show with her summer hit "California Gurls." Although the catchy song was overlooked in the Record and Song of the Year categories, the 26-year-old's album "Teenage Dream" is up for Album of the Year. Performing via sateliate from London, teen sensation Justin Bieber, who earned a Best New Artist nomination, performed his song "Favorite Girl." Rounding out the night's performances was Miranda Lambert, who sang "Only Prettier," and Train, who performed their song "Hey, Soul Sister." The 53rd annual Grammy Awards will air live on CBS from Los Angeles on Feb. 13.